Remodeling someone’s home or building a home addition is, for us, almost exactly the same process as building a custom home. All of the same considerations are required, preliminary plans must be considered, finishes chosen, and a budget must be created. However, in many respects it can be a more complicated than starting with an empty building site because we have the existing home to add into the equation. Finding innovative solutions to adjusting the existing home is one of the most interesting parts of the renovation challenge. Green concepts can be brought to the design and incorporated to whatever extent our client desires. In some circumstances it is possible to retrofit the existing residence and make it more energy efficient. We have no minimum size or budget and frequently take on projects with budgets as low as $20,000. We bring all of the same consideration, management, subcontractors and suppliers, and enthusiasm to all of our clients regardless of their budget. 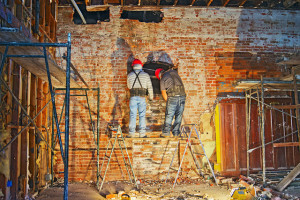 For many, remodeling is a great solution to getting the home that they want.